Germany embarked on Energiewende in 2010 with the goal of eventually making Germany independent of fossil fuels. The idea was to phase out oil, coal, and natural gas to allow for drastic reductions in carbon dioxide emissions. Since 2009, Germany has spent over a hundred billion euros on solar and wind energy, but carbon dioxide emissions did not decline over that period. In fact, they have risen by about 2 percent. The financial obligations from the expansion of wind and solar energy will continue to burden taxpayers for another two decades and will end-up costing German consumers around 550 billion euros. 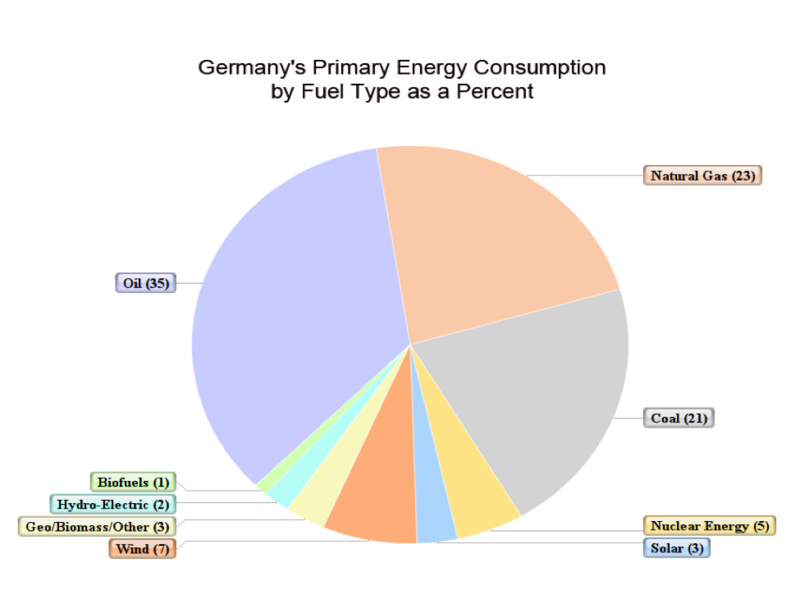 In 2017, Germany’s energy consumption was fueled primarily by fossil fuels (79 percent). Renewables including hydroelectric power provided 15 percent and nuclear energy 5 percent. Despite the generating sector providing just about one-fifth of Germany’s total energy consumption, it was targeted to phase out its fossil fuel generating capacity under Energiewende. When the tsunami hit Japan in 2011, Germany decided to phase out its nuclear power first despite the unlikelihood of a similar disaster hitting Germany. Germany’s nuclear generation has declined by 56 percent since it reached its peak in 2001. Germany’s nuclear plants are to be shut down by 2022 and its coal-fired plants are to be closed by 2030. Germany backs up its wind and solar units with coal-fired and natural gas-fired generation. Germany has 36 billion metric tons of coal reserves and produces domestically about half the coal it consumes. Despite its desire to reduce carbon dioxide emissions, Germany is bulldozing centuries-old villages and displacing their residents to make way for open-pit brown coal (lignite) mines. Having very few reserves of natural gas, it imports natural gas by pipeline with over half of it coming from Russia. Germany is Europe’s biggest natural gas consumer, and its demand is expected to rise by about 1 percent over the next five years as it phases out its nuclear fleet. A new natural gas pipeline, the Nord Stream 2, is a 1,200-kilometer (746-mile) proposed pipeline, which would connect the Ust-Luga area near Saint Petersburg with Greifswald in northeastern Germany. It is expected to be operational by late 2019. 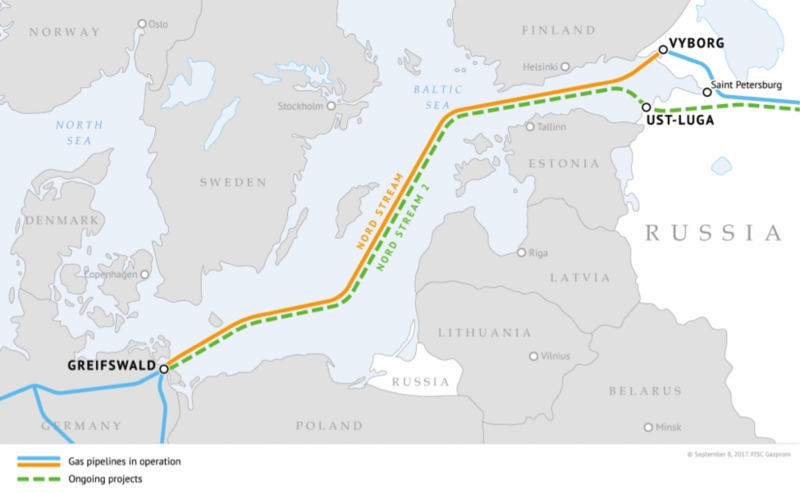 It would run across the Baltic Sea, basically following the route of the pre-existing Nord Stream 1 pipeline, which became operational in 2011, and bypassing central and eastern European countries such as Poland. It would carry up to 55 billion cubic meters (1.942 trillion cubic feet) of natural gas per year, allowing Germany to effectively double the amount of gas it imports from Russia. In 2017, Germany used a record 53 billion cubic meters of Russian gas, which made up about 40 percent of Germany’s total gas consumption. The pipeline would allow Russia to be able to directly deliver gas to Germany, making it easier for the Russian government to shut off existing pipelines leading through Eastern Europe. Russian energy company Gazprom is the sole shareholder of the Nord Stream 2, the company in charge of implementing the €9.5 billion ($11.1 billion) project. Gazprom is covering half of the cost with the rest being financed by five western companies: ENGIE, OMV, Royal Dutch Shell, Uniper, and Wintershall, who have extended the repayment period until 2035. Russia’s gas exports to Europe rose 8.1 percent in 2017 to a record 193.9 billion cubic meters, with Gazprom holding an effective monopoly over Russia’s network of pipelines to Europe, supplying 40 percent of Europe’s gas. Germany announced plans to build a $500-million (€420-million) liquid natural gas (LNG) terminal on the Elbe river in northern Germany. Brunsbüttel would be Germany’s first LNG plant and is expected to be on-line by the end of 2022. The European Commission approved the project last July. The terminal would be accessible to Scandinavian markets and the Baltic States via the Kiel Canal. It would be able to import as much as 5 billion cubic meters per year—about 10 percent of Russia’s current annual deliveries to Germany, thereby diversifying energy supply and contributing to energy security. A final investment decision is expected at the end of 2019. Gazprom has been obliged to lower its natural gas prices on many of its long-term contracts with European customers due to competition from LNG. Lithuania, which was paying the highest price for Russian gas in the European Union, received a 23-percent discount on Gazprom’s supplies just before opening its first LNG terminal, Independence, at the port of Klaipeda in 2014. Poland’s state-owned oil and natural gas company PGNiG signed a five-year deal to import LNG from the United States in November 2017. The agreement is for shipments between 2018 and 2022. In 2017, Poland opened an LNG receiving terminal on the Baltic Sea, receiving its first LNG shipment from the United States that June as part of a spot-market deal. There are currently 28 large-scale LNG import terminals in Europe with capacity to process 227 billion cubic meters. There are another 8 small-scale facilities in EU countries, and nine more terminals that could come online through 2021. Europe has already begun buying more natural gas from the United States, with Portugal and Spain emerging as two of the most steady buyers and Britain, Italy, Lithuania, and the Netherlands each importing a few cargoes. Germany is heavily dependent on fossil fuels and is the largest consumer of natural gas in Europe. With little of its own natural gas production, it is dependent on imports; over 50 percent of that comes from Russia. A new proposed pipeline, Nord Stream 2, would carry natural gas from Russia directly to Germany, essentially doubling Germany’s available imports from Russia. Germany is also contemplating building an LNG import terminal on the Elbe river in northern Germany as a means to diversify supplies and improve national security. President Donald Trump’s recent discussions with European leaders about the U.S. potential to supply them with more of their natural gas needs through LNG would help reduce Russian influence over those nations since energy is so essential to their economic well-being.